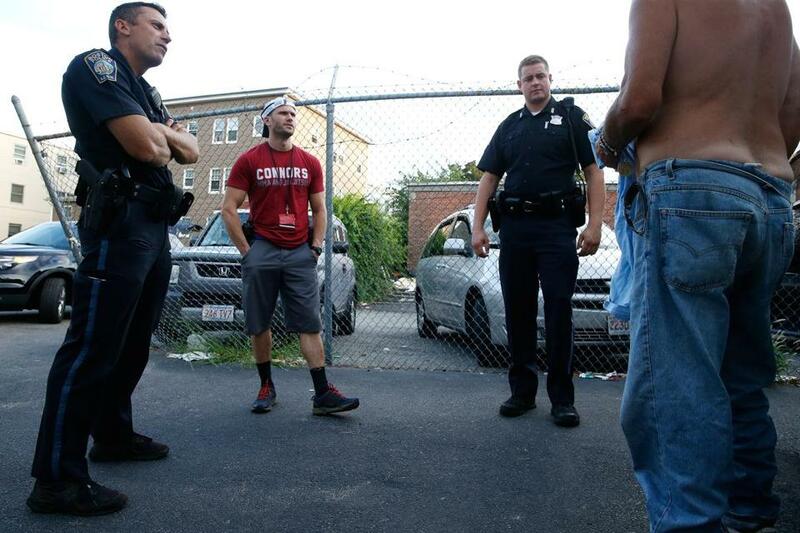 “Operation Helping Hands,” made up of two officers and a crisis clinician, is the only Boston Police unit of its kind. The shirtless man swayed in the evening heat. No, he told the two police officers and mental health counselor who stood with him in the back lot of the Smokehouse in Mattapan, he did not need a ride to a homeless shelter. No, no detox. Two cans of Busch beer sat on the concrete loading dock behind him. “There’s nothing you can do for me,” Edward said slowly. But his visitors weren’t leaving. When Officers Michael Sullivan and Jeff Driscoll and senior crisis clinician Ben Linsky head out on their beat in Mattapan, they seek out the most vulnerable citizens: the drug-addicted, the homeless, and the mentally ill. Theirs is the only unit of its kind in the city, and its mission since it was started in February is to help, not arrest, people like Edward. It’s part of a broader effort in the Police Department to work with the community. Police Commissioner William B. Evans has directed his officers to act as “guardians,” not “warriors,” and has pointed with pride to a 10 percent drop citywide in arrests this year. Officer Jeff Driscoll waved to people sitting outside at Franklin Field while on patrol. On this night in Mattapan, the unit learned Edward had just lost his housing. He was afraid of a winter out on the streets. A summons for trespassing wouldn’t solve the problem. “If I don’t have a place to stay, I’m just gonna fade away,” Edward said. “And someone I can trust,” Edward muttered. Sullivan, Driscoll, and Linsky, who make up Mattapan’s “Operation Helping Hands,” spend two nights a week freed from dispatch calls. Instead, they get to know the people on the streets, figure out what services they need, and try to provide them. 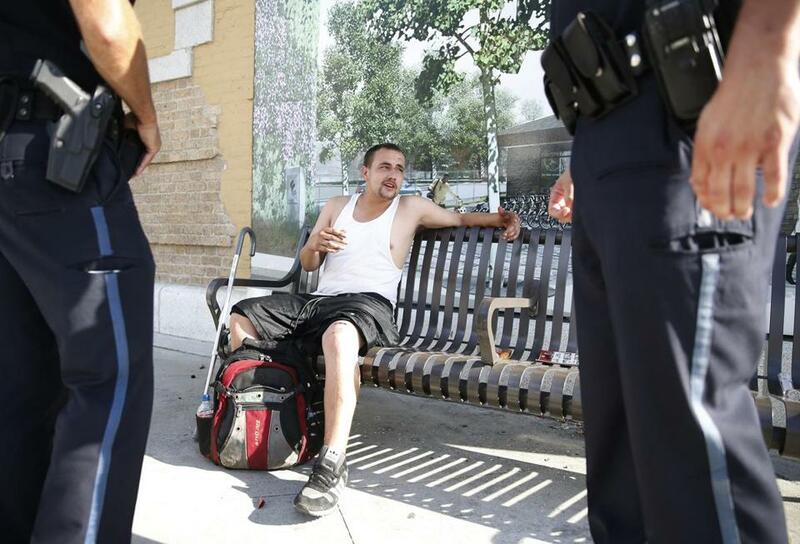 “You’re one part social worker, one part cop, and one part older brother,” Sullivan said. At a time when the national dialogue often focuses on police brutality, Boston police officials have consistently emphasized a “soft approach” to policing. Officers are encouraged to have friendly conversations with residents, go on peace walks through the neighborhoods, play basketball with local kids, and deescalate tense situations by backing off and negotiating. 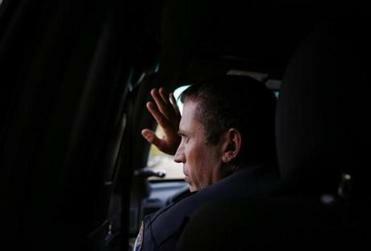 The department has not always been successful — a recent poll suggested that one in three black Bostonians do not feel they are treated fairly by police, and in May, a video surfaced of an off-duty officer apparently roughing up a civilian who tapped his car window. But the city has escaped the kind of unrest that many large departments have seen. Driscoll, crisis clinician Ben Linsky, and Officer Michael Sullivan chatted with a man who they regularly check in on in Mattapan. Crime statistics suggest the approach is having an impact. As of Aug. 28, major crimes had dropped 6 percent this year compared with the same period last year, according to police statistics. 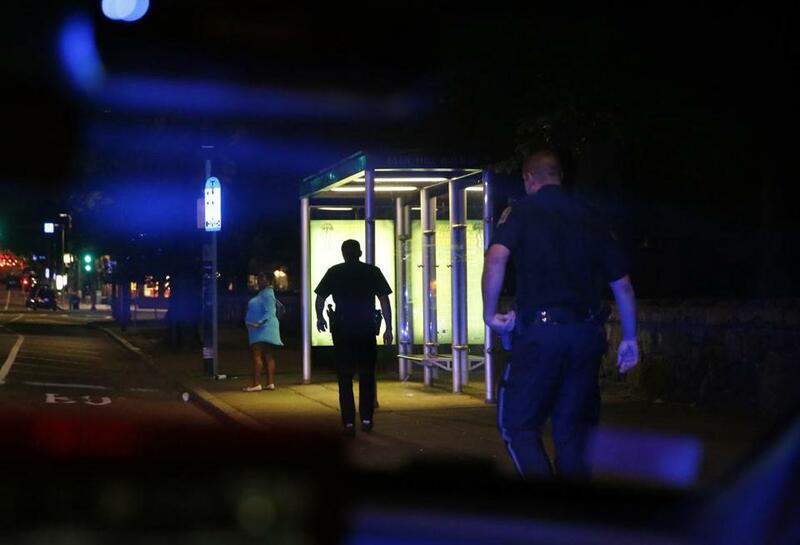 Homicides were up from 23 to 24, but shootings across the city were down from 170 to 143. The city had 50 shootings in the often-violent months of July and August this year, compared with 72 in the same period last year. But the number that Evans is most proud of is arrests: for the past year and a half, officers have been locking up fewer and fewer people. The city saw a 15 percent reduction in 2015, followed by the 10 percent drop so far this year. Driscoll, a 39-year-old father of two, has been on the force for 10 years, all of them in Mattapan. Before that, he served for several years in Watertown. He and Sullivan, a 32-year-old father of a 2-year-old boy, who joined the force three years ago, both grew up in police families, wanting to be officers. When Mattapan Captain Haseeb Hosein decided to start Helping Hands, they were an easy choice. 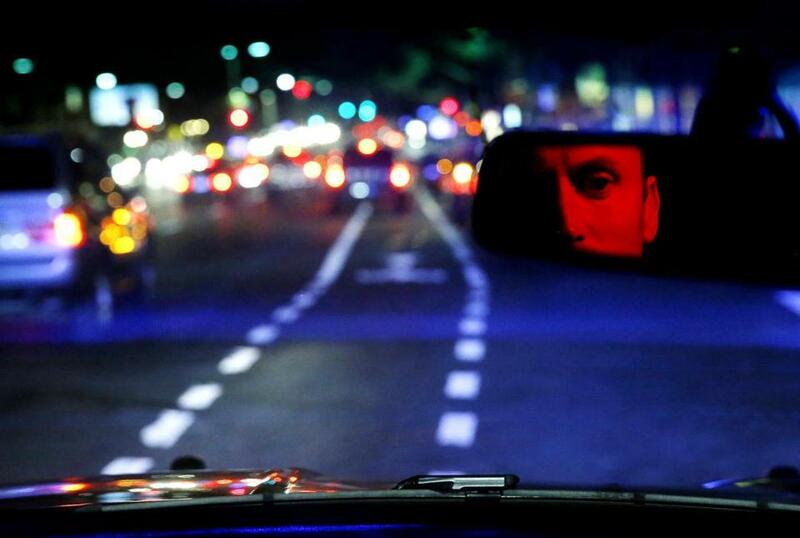 Driscoll, as reflected in his rearview mirror. Linsky, 34, who works for the Criminal Justice Diversion Program through Boston Medical Center and the Boston Police Department, thought he would work with police only until he could get into medical school — but five years later, he hopes to become a police officer. When he’s not riding with Driscoll and Sullivan, he’s responding to 911 calls that involve people with mental health issues. The trio’s practical and kind approach, Hosein said, is the direction in which policing is headed. The first act of the team’s shift Thursday night was to spot a regular panhandler, Danny — a character who sweeps the median every night — and notice he was limping. “He’s not looking good,” Sullivan said as they turned their car around. They were right: Danny lifted his shorts to reveal a bloody, swollen wound. He’d been hit by a car, he said. With a little convincing and a few jokes about workers’ comp, he accepted an ambulance ride to the hospital. By 8 p.m., Driscoll, Sullivan, and Linsky pulled up in front of a liquor store at the corner of Blue Hill Avenue and Landor Road to find a familiar group of three drinking on the sidewalk. The lone woman, who stood with her shirt hiked up, swaying her hips, had a long psychiatric history. At first, the team just sat in their car. A warning, they said. The group didn’t move. The officers flipped on their lights and waited five minutes. Another chance. But the group kept drinking. So Sullivan and Driscoll hopped out and walked over. One of the officers said the men claimed he was only drinking ginger ale, and said the officers were harassing them. “You gotta move it along,” Sullivan replied. No arrests. Sullivan and Driscoll got back in their cruiser, and one by one, the drinkers sauntered away. Sullivan acknowledged he could have pushed it — he could have grabbed the man’s drink and sniffed. But then what? he asked. The man grabs his arm? He wrestles the guy to the ground? Driscoll (center) and Sullivan approached a woman who jumped out of a vehicle in the middle of Blue Hill Avenue.